Fraunhofer Institute for Integrated Circuits IIS and FAU have agreed to extend their collaboration in their joint institution, International Audio Laboratories Erlangen (AudioLabs). This unique teaching and research institution has been successfully carrying out research and development on audio and multimedia technologies since 2010. The collaboration was initially agreed upon for ten years. The fact that it has now been extended by five years before the end of the initial period highlights the significance of this unique alliance, and will allow greater planning security and strengthen the collaboration between the two partners. The work being carried out at AudioLabs can now continue until 2025. Fraunhofer-Gesellschaft and FAU have signed a contract extending AudioLabs’ research work for another five years, securing the foundation for the development of new ideas and technologies for digital processing of multimedia content until 2025. The new Enhanced Voice Services (EVS) codec will enable exceptionally clear voice and audio quality in mobile communications in the future and lead to a new age of mobile phone conversations. Thanks to EVS, users will be able to make calls using Voice over LTE (VoLTE) or Voice over WiFi (VoWiFi) in the best possible hi-fi quality, significantly improving comfort. The researchers have also contributed to a new audio format that was developed parallel to Ultra High Definition TV (UHDTV) and 4K, and is set to improve TV viewing with an impressive audio experience. The MPEG-H Audio standard, developed with significant contributions from Fraunhofer IIS, will allow viewers to change between different languages or audio tracks and adjust the volume of presenters or dialogues. Surround sound can also be transmitted with MPEG-H Audio, bringing an even more realistic impression of the live atmosphere of a stadium, concert hall or rock concert to viewers’ living rooms. ‘AudioLabs unites two strong partners and their expertise. Pooling Fraunhofer IIS’ many years of experience in audio coding and the academic knowledge of international researchers from a wide range of subjects is what has made the previous success possible. Just as the collaboration between Fraunhofer IIS and FAU once transformed mp3 from a promising technology to an international standard and major success, we have now laid the foundation for new successful technologies together, such as the mobile communication technology and television viewing experience of the future. We are looking forward to continuing our close collaboration and being able to continue developing our research topics in the coming years,’ explains Dr. Bernhard Grill, Acting Director of Fraunhofer IIS. In addition to pioneering research that is applied in the development of new audio and multimedia systems, teaching is a key priority for AudioLabs. ‘Educating and supporting young researchers not only ensures the high quality of our research but also strengthens innovation and scientific progress. By extending the contract we have paved the way for us to train the researchers of tomorrow and continue contributing to new breakthroughs in media technology,’ says Prof. Dr. Jürgen Herre, Professor of Audio Coding at FAU. 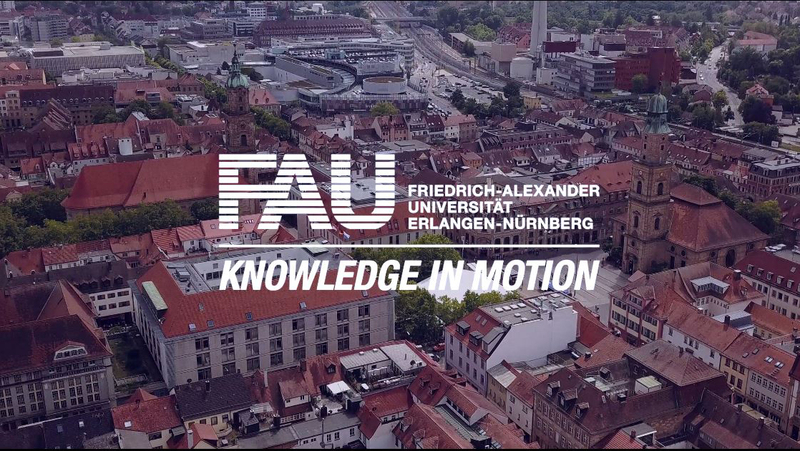 ‘It is this mixture of solid theory, basic research, academic excellence and skilled engineering that draws students from all over the world to Erlangen, which hugely benefits the international reputation of our university,’ says Prof. Dr. Joachim Hornegger, President of FAU. ‘There is a tradition of developing successful audio formats in Erlangen – it is strongly linked with our city. 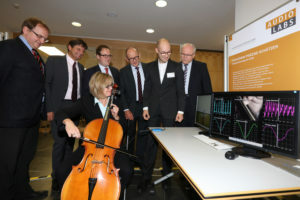 I am delighted that we will be able to continue this tradition with AudioLabs in the future, further strengthening the national and international reputation of our city and the region as important locations in technology and research,’ adds Dr. Florian Janik, mayor of the city of Erlangen, who was present for the signing of the contract.